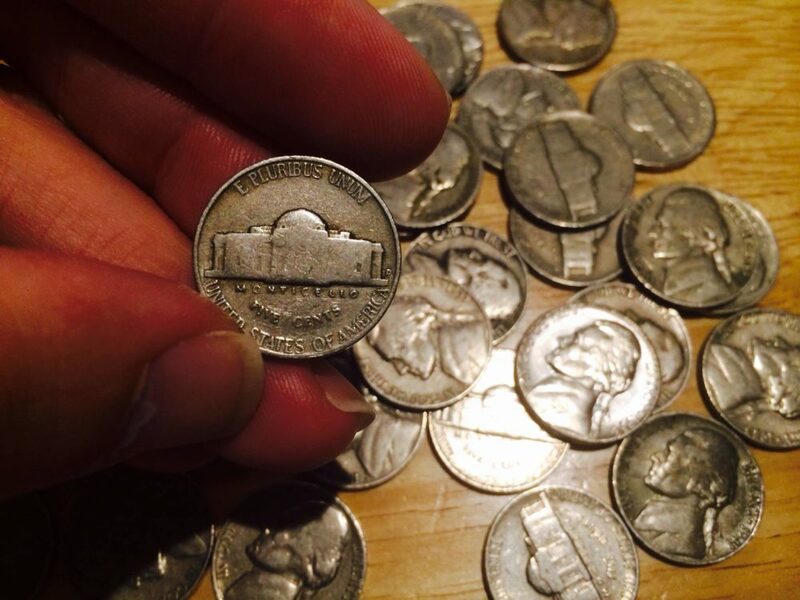 Did you know there is a rare Jefferson nickel worth $10,000 or more that you may find in your spare change? There are many rare nickels that you can still find in circulation — many of these are very valuable coins! In fact, there are several rare Jefferson nickels worth some serious cash. I’m going to tell you what they are and how you can find them. No kidding, there really is a Jefferson nickel worth up to 5 figures. You can find one searching through pocket change or bank rolls — if you’re lucky enough. It’s the 1942-D Over Horizontal D Jefferson nickel, and uncirculated (unworn) examples are worth thousands of dollars! I’ll fill you in more about this rare and valuable nickel in a minute. First, you need to know what to look for when you’re studying Jefferson nickels. Among all circulating United States coin series, Jefferson nickels are the easiest old coins to find because very few non-collectors can tell the differences between an old Jefferson nickel and a newer one. The first Jefferson nickels were minted in 1938, and some of the earliest examples are still floating around out there. At first glance, all Jefferson nickels made before the Westward Journey commemorative series of 2004 to 2005 look about the same. And this is where it pays to be an astute coin collector. Most circulated old Jefferson nickels have a dull, grayish appearance. Find a 1942, 1943, 1944, or 1945 Jefferson nickel with a large “P,” “D,” or “S” mintmark above the dome of Monticello, and you’ve got a 35% silver nickel worth $1 or more! Mintmarks on nickels made before 1965 are found on the reverse (tail’s side) of the coin — not under the date as with 5-cent coins made since 1968. Thankfully, 1942 nickels still turn up in circulation every now and then. So the odds of finding a 1942-D Jefferson nickel in your pocket change or through roll searching aren’t all that terrible, considering the age of these coins. According to the Professional Coin Grading Service (PCGS) one of the leading coin authentication firms in the world, there are only about 20,000 of the 1942-D Over Horizontal D Jefferson nickels around. Circulated examples of the 1942-D Over Horizontal D Jefferson nickel are worth $50 to $150 — not bad! Uncirculated examples of the 1942-D Over Horizontal D Jefferson nickel are worth between $1,500 and $15,000 — with Full Steps specimens listing for more than $30,000! You’ll have to get very lucky to find an uncirculated 1942-D Over Horizontal D Jefferson nickel in a bank roll — not impossible given the number of uncirculated 1940s and 1950s Jefferson nickels that still turn up on occasion in some bank rolls. You could also find an uncirculated 1942-D Over Horizontal D Jefferson nickel in an heirloom coin collection or an estate. You might even find one hidden in a coin hoard buried in a yard. Sound far fetched? Think again… one couple scored millions when they dug up a hoard of gold coins buried in coffee can on their property! Before 1990, Mint operator handpunched mintmarks on coin dies, and sometimes the mintmark was accidentally applied in the wrong direction, such as the 1942-D Over Horizontal D nickel. Usually the mintmark orientation was corrected by re-stamping the mintmark over the wayward mintmark, resulting in these crazy-looking mintmark errors. There are many other valuable Jefferson nickels that can be found in loose change. *Values included in the list directly above are for coins in a grade of Very Fine-20 in the cases of those made before 1960 and uncirculated for dates afterward unless otherwise noted. How Much Are Jefferson Nickels & War Nickels Worth? Are Old Jefferson Nickels Worth Anything?